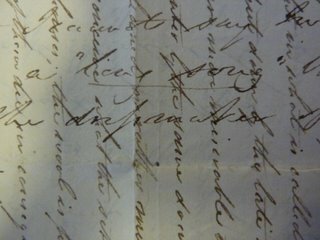 Kenny from Stornoway Historical Society called in the other week for a little help in deciphering the writing in a letter written in 1827 from a factor and solicitor visiting Stornoway back to his wife in England. When I trained as an archivist one of my favourite classes was in palaeography- the study of reading old forms of handwriting – so I was eager to flex some old muscles that hadn’t been used for a while. 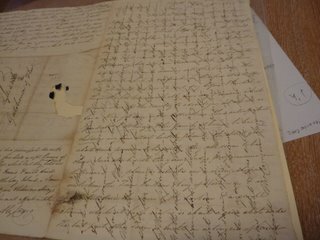 It is a fascinating letter which will feature in one of the Historical Society’s forthcoming newsletters but it wasn’t always the easiest of handwriting to read. The writer wished to make the best use of his expensive paper, so once he had filled his sheet with his text, he rotated the page 90 degrees and continued writing to create a text grid effect. At points it was difficult to tell which letter stems and decorations belonged to which direction of text! Kenny had done a valiant job in transcribing most of the document and together we corrected a few errors and managed to fill in virtually all of the gaps. It took us an hour but it was fun. The following word (below the underlined “long song”) below took us ages to decipher. Once we got it, it was obvious, but by this point our eyes were sore! Can you get it?